October 7, 1950 Gene Autry debuts "Frosty the Snowman" on his Melody Ranch radio show and admits that he "might be rushing the season" but he wants to introduce his audience to "Rudolph the Red Nosed Reindeer's friend." October 8, 1949 Johnny Bond asks "Who's Rudolph?" and Gene explains saying "'Rudolph, the Red-Nosed Reindeer' is a song I recorded just a while back..." and then debuts the song that would go on to sell millions of records. November 1, 1953 Gene says, "Well sir, here it is Sunday, November 1st, all of which reminds me of two things. One, there are only 46 more shopping days until Christmas, and two, a very close personal friend of mine just sent me a wire from the North Pole sayin' he'd be back bigger than ever again this year. Red nose and all. Who is it? Well..." The radio audience of course knew that he was talking about "Rudolph, the Red-Nosed Reindeer." November 8, 1942 Sgt. Gene Autry introduces "White Christmas" by saying, "But our time is getting close to the end of our radio part of the entertainment and Christmas is not too far away...." This particular performance is significant because it is the second performance by Gene of a Christmas song on his radio program. The first Christmas song that he sang on his show was "Silent Night" on December 22, 1940 in the drama. The very first Christmas song on his Sgt. Gene Autry radio show was this one. Over the years, Gene did debut several Christmas song on his radio show in the months of October and November. He may have done that to generate record sales and give a song time to become popular when December rolled around. Whatever the reason, his holiday hits remain popular today. 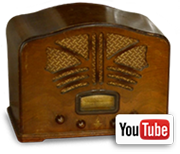 Check out our Gene Autry Official YouTube Channel for more Christmas songs from his radio show here.